My Cavers one-name study is registered with the Guild of One-Name Studies. One of the advantages of that is I that get to tap in to the knowledge and expertise of other members. And also sometimes others can access historical records in local archives I could not easily access myself. This is particularly the case with the regular Marriage Challenges. In England and Wales marriage certificates cost 9.25 pounds to get copies of each time, just to see the details. There is no open access system as there is in Scotland, and no digitised online relatively low-cost access method, as in ScotlandsPeople. So to see what a marriage says I have to fork out a lot each time, and I can’t afford to do that very often. An alternative is to look in the church registers for the parish where the couple married, if they married in church, to find their marriage recorded that way. This only usually works if you know exactly which parish to look in. Unless, that is, you are doing a marriage challenge and checking all parishes in a given district in a blanket search way. There the Guild member takes a list of marriages for theirs and other one-name studies known to have happened in a single registration district, and looks for those marriages in ALL of the surviving church parish registers. It helps if you can provide the Guild member doing the Marriage Challenge with a precise marriage parish – if for example recorded in the IGI or FamilySearch – and the name of the spouse if known. But generally they work from just the bare details: that a marriage of a particular one-name study surname person was recorded in district X, quarter Y, year Z. Usually I don’t have any success with Cavers lookups in English and Welsh Marriage Challenges. The surname is so rare in England and Wales that there typically aren’t any marriages registered in the single district being checked each time. 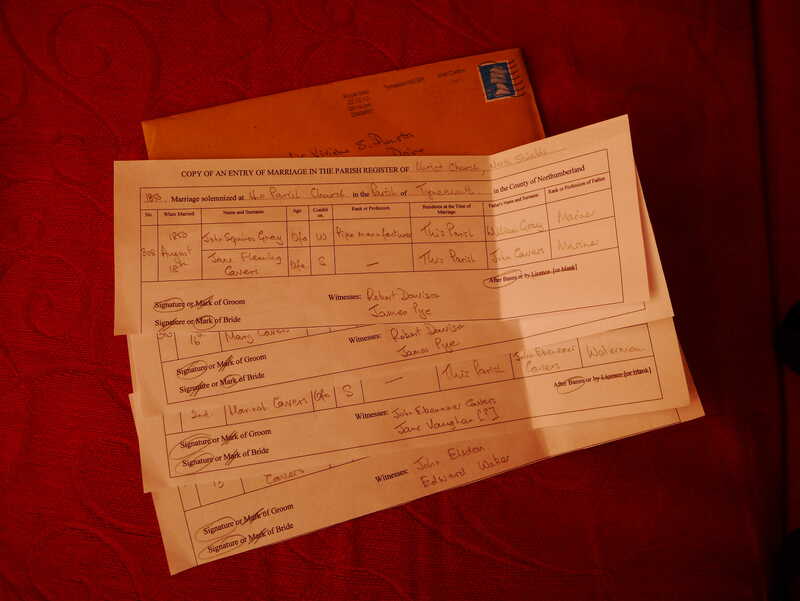 Even if there are Cavers marriages in the district, as happened recently in a Marriage Challenge for a registration district in north Northumberland, very near the Border with Scotland, the family are either non-conformist so their marriages don’t appear in the deposited Church of England church registers, or they married in registry offices. So again zero results. That’s what usually happens. But today in the post, thanks to fellow Guild member Phil Thirkell and his Tynemouth Marriage Challenge, I have received the details of four Cavers marriages that are all new to my research. All are from the extreme southern tip of Northumberland in north-east England, near Newcastle. Three of the marriages took place in Christ Church, North Shields, and were marriages of siblings from the same family, all daughters of John Ebenezer Cavers, waterman. First Jane Fleming Cavers married pipe manufacturer John Squires Gray in August 1850. A few months later her older sister Mary married miner Joseph Johnson in November 1850. Finally their younger sister Hannah married in January 1858, to joiner John Elsdon. This Cavers family can be readily located in the 1841 and 1851 census returns. In 1851 Jane and her new husband were living with their widowed father and sister Hannah. The fourth Cavers marriage that the Tynemouth Marriage Challenge found was from the following generation of this family. Margaret Jane Cavers, daughter of Joseph Ebenezer Cavers and niece of the earlier brides, married at St Peter, Wallsend, in September 1868. Her husband was sailmaker John Weatherston, and her father Joseph Ebenezer Cavers was noted as a blacksmith. He shows up in the 1841 census with his father John Ebenezer Cavers and siblings, and can be traced forward in time. I need to research this Tynemouth family more. I’ve been contacted by a descendant in the past, but was unable to provide new information for them. But I should put together what I know so far, and document it, before seeing where I can extend it. Today’s Marriage Challenge results move things on a lot and give me a very good basis to work from. Ancestry have recently released images and indexes for lists of registered voters for federal elections in Canada between 1935 and 1980. Voters were men and women aged 21 and over, and include a good number of Cavers people. I have only checked the voters list for 1935, and would recommend that descendants check the later years for their own ancestors. Meanwhile here are my findings from 1935. I found 116 Cavers voters in 1935. Note there may be some missing from the list: I was largely relying on OCR-generated indexes, and sometimes the OCR quality wasn’t great. It’s interesting to compare the 1935 distribution against the 1881 census analysed in the last post. Again Ontario residents dominate the list, with 54% of the voters found living in that province. Smaller numbers of voters are found in other provinces, again Quebec and Manitoba, but now other places like British Columbia, Saskatchewan and Alberta. In the lists below married women are indicated by words or MW, and I think W indicates a woman. Lists of voters below are given by province, starting with the province with the highest number found. And before each name is where that person was registered as a voter. I’ve been searching for Cavers people in the 1881 Canada census, using transcripts and images online at FamilySearch and Ancestry. I’ve found 110 people now, and of those 89 can be linked to families traced back to known Scottish origins. But another 21 people had so-far mysterious origins. 4 of the Cavers people found lived in Manitoba. These were two brothers from Hawick, Roxburghshire, both sons of Robert Cavers and Elizabeth McPherson. The younger brother John, 21, was recorded at Rockwood, Lisgar, with his wife Frances and baby son Robert. At Winnipeg, Selkirk, was John’s brother James, 31, a clerk. in Sydenham, Grey North, blacksmith William Cavers, 24, and his recently-married wife Mary. This couple were children (separately) of my distant g..uncle Thomas Cavers and his wife Eleanor or Ellen Ryder (nee Cavill) and married in March 1881. 8 Cavers people living in Gainsborough, Monck, were descended from Walter Cavers (b. ca 1825, Hawick, Roxburghshire) and his wife Christina Anderson (previously Mrs Wilson) from Aberdeenshire. This family has unknown origins and needs to be researched further. One theory is that Walter was another illegitimate son of Elizabeth Cavers (ca 1793-1872), daughter of John Cavers and Christian Hardie who married in 1791 at Hawick. Elizabeth had one known son John Cavers (b. ca 1823, Hawick), also known as John Irvine, who married Janet Graham and had a large family in Scotland. In the 1881 Canada census Walter and his wife Christina are listed with two of their younger children, and in a separate household is their son John, his wife Almeda, and children. 6 Cavers people in St Catherines, Lincoln, were descended from William Cavers (b. ca 1800/1805, Scotland) and his wife Mary ???? (b. ca 1810, Scotland). Again this is a family we can’t trace back to known Scottish families. William Cavers died in 1878, so the family in 1881 census was his son William and wife Maggie and children, as well as 70-year-old widowed Mary Cavers. 5 Cavers people lived in Orford, Bothwell, the family of Luke and Emily Cavers, and probably their son William Cavers and his wife Laura from USA. This is another mystery family. Luke Cavers was b. ca 1812 in Scotland, and can be traced in Canadian census returns from 1851 onwards, but can’t be linked up yet to any family or birth events in Scotland. The 1871 census suggests that Luke and Emily probably had younger sons George and Walter, names which might help suggest possible Scottish roots. 2 Cavers people lived in Williams West, Middlesex North: Thomas Cavers (b. ca 1815, Scotland), Plasterer, and his wife Sarah (b. ca 1817, England). This couple can be traced in various census returns, but again can’t be linked up to Scotland, and have mystery origins. There was another Thomas Cavers of a similar age living in Owen Sound, my distant g..uncle, but the Williams West one was different (both Thomas Cavers men listed separately in the same census returns) and currently a mystery. Of the 110 Cavers people found in Canada in 1881 98 have traceable origins back to Roxburghshire. By this time the Canadian Cavers population was greater than the Scottish Cavers population, with only 82 Cavers in Scotland in 1881, and only 46 in Roxburghshire. P.S. There may have been more Cavers people in 1881 Canada who I didn’t find in my census search, either because they were misrecorded, or mistranscribed. If anyone can pinpoint more Cavers people – finding them recorded in the original census images – let me know. Also I’d be grateful for comments about any who should have been there.